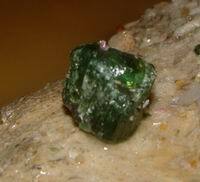 After the discovery of pocket 7-06 and its gemmy tourmaline we continued working to the north hoping to find more. 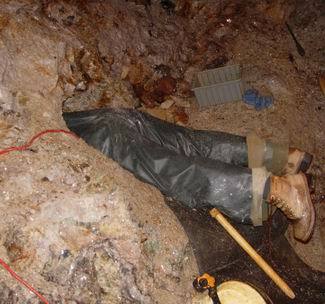 Less than 1.2m (4') we intercepted pocket 8 while drilling lifter holes to clear the pegmatite above the mineralized zone. 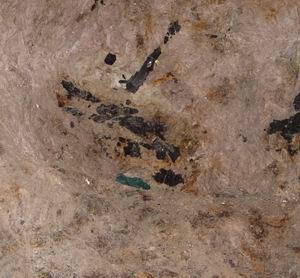 Pocket 8 produced a number of small crystals that were essentially colorless ( achroite) save for pale green pinacoid terminations. Like the material from earlier pockets, these small tourmalines were very similar to the ones depicted in Hamlin's watercolor renderings in 'The History of Mount Mica...' This pocket did nothing to dissuade us that we were indeed 'in the zone' of the classical material. Several large but badly fractured scaled up versions of these tourmalines were locked in the lepidolite that formed the floor of the pocket. Not too far to the north of 8, less than a meter, we opened pocket 9. This was similar to 8 but not so nearly well endowed. Not that 8 was all that great. The image above shows the expanding stope ( or Mount Mica Heights as Richard calls it). Mary is sitting working pocket 8. Notice the concentration of schorl in the face above her head. Such concentrations are one of the more reliable pocket signs. mica books covering the top had been removed. After 9, we continued advancing our workings to the north. Once we had completed the burn in the face we could then it widen along a considerable distance. Thus the expensive burn procedure was producing a greater workable face as we enlarged our chamber. Our efforts along the northern face produced only one small pocket, 10-6. Mary found this space as she sounded along the face until a decided bass drum tone replaced the sharp ring of her hammer striking solid ledge. 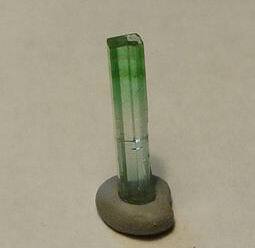 This pocket produced only a couple of tourmalines. The color was to the blue side of green and they were mainly opaque. Each time we do an advance we try to 'fan' into the side walls in order to widen the space we are opening. So after the advance to the north, we fanned the eastern wall. This gained up about 4 feet in that direction. After this we again used our drifter drill to work the newly accessible mineralization. 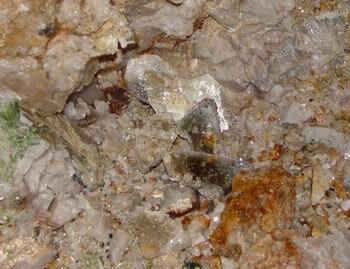 We had modified our practice to drill directly into the highly mineralized portion of the pegmatite. 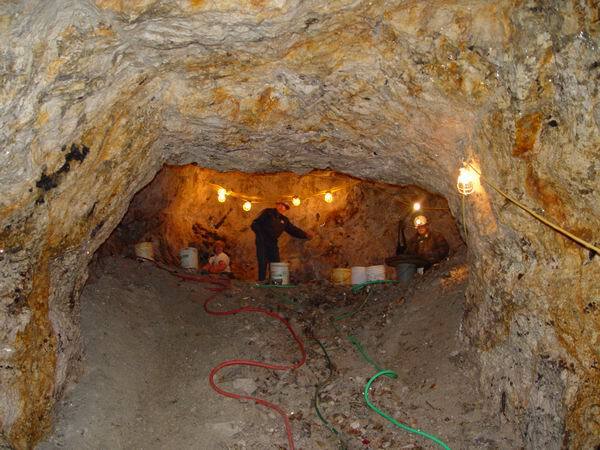 In so doing we hope to intercept the pockets and then drill other horizontal hole in location such as to avoid damage to the pocket by the subsequent blasting. A perfect scenario is to then dill and blast such that the pocket is then accessible by hand tools or by a little work with our CP-9 pneumatic chipping hammer. The difficulty of this method is we are not on a 'level playing field'. 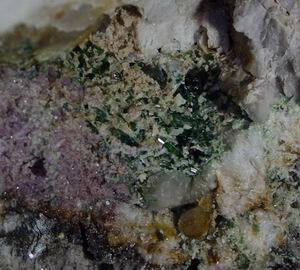 Not only does the pegmatite dip and plunge but the mineralized zone rises and falls in a seemingly random pattern. Hence, our opening of pocket 11 was not textbook and was a complete surprise. We had drilled and blasted nearly directly under it...a worst case scenario. We are not certain how much of 11 we sent out to the dumps. Though we did work through the muck pile as best we could or attention was focused more on the portion of 11 that still was dangling from the new exposure. On aspect of this pocket immediately drew our attention. 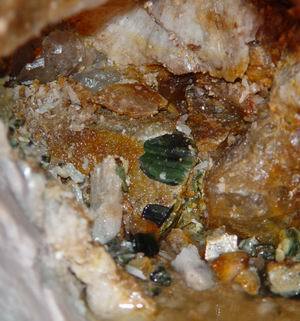 We noticed a green tourmaline druse that lead directly into the several spaces that comprised 11. At distance the druse was simply seamy green. 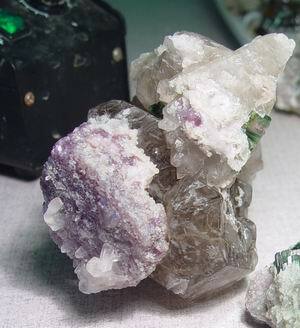 But as it approached the spaces the druse developed more and more discrete crystal forms. Doubtless that under magnification the druse too was well crystallized. As we used our garden house adjusted to produce a water pick stream, we could see many green terminated crystals of elbaite bubbling up out of these expanding spaces as we sprayed them. 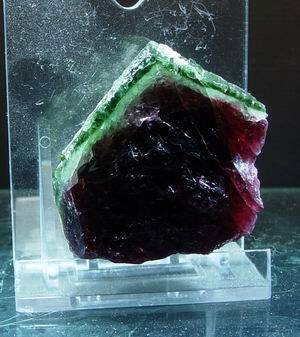 Pocket 11 yielded, besides many small elbaite crystals, some fine smokies on lepidolite and, in the classical tradition of Mount Mica, our first true watermellon tourmaline. Though decidely fractured and wedged into nearly unworkable spaces, it was no doubt that this was the real thing. Though we were to work the area around this pocket for several times over the next few weeks what intrigued us was the steady but small trickle of water into the back of this pocket. After 3 years of working at Mount Mica we were waterwise. That is to say that these small flows emanated from yet unopened spaces. Large cavities, by virtue of their surfaces area, can accumulate a steady reservoir of infiltrating water. If large enough, the flow is inexhaustible. The water that is drained is replaced by new seepage. All of this is a function of surface area. 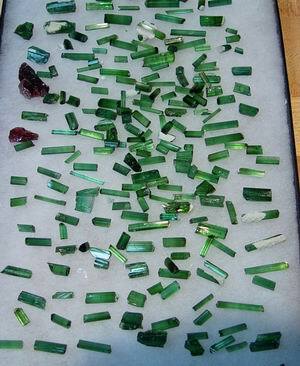 A collection of small green elbaite. Pocket 12 turned out to be the largest of the season thus far. 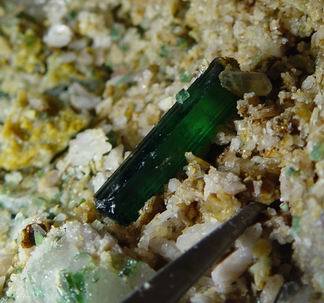 Once we began' water picking' the opening, we could see several large tourmalines. 12 proved to be pretty much typical of the pockets we had been finding thus far along our stope. 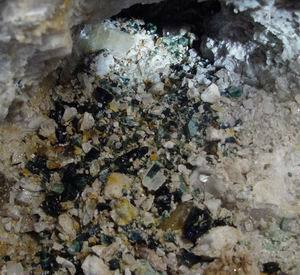 The difference was the large tourmalines and for the first time some tourmaline nodules of some size. 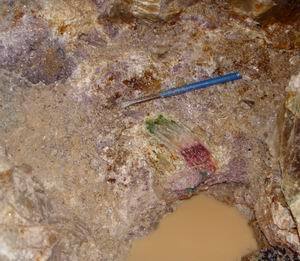 We also find some very nice tourmaline rods to 6 cm. When completely dug, the pocket turned out to be about 1 meter long. 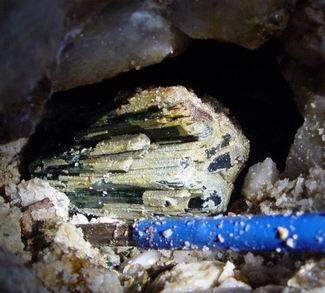 The curious thing was that all of the large tourmalines were bunched up on the down dip end where we had opened it. 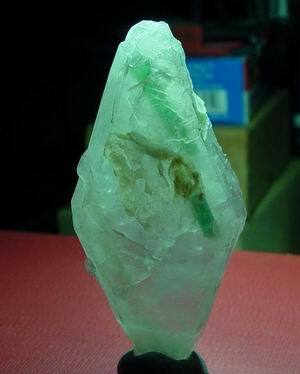 The rest of the pocket contained smaller crystals. We found one beryl in the pocket. 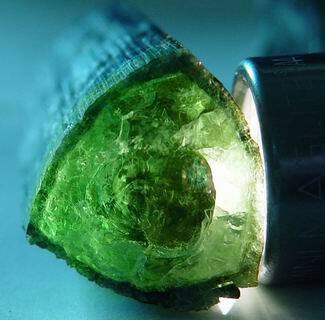 Once it was cleaned, the beryl was essentially colorless save for a distinct navy blue band in the interior of the crystal. A few days in the sun brought out a decided pink color and, to my astonishment, the blue band disappeared. Color seems to be most ephemeral. crystal at the rear. Another view is at the top of the page. the direction in which we should mine.